Our 10' foot dart board is the perfect addition to any party or bubble soccer package! Foot Darts is the latest sport to go viral where football and darts are linked together. 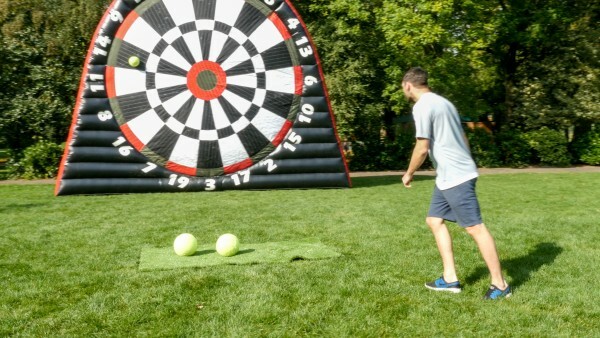 The aim of the game of Foot Darts is playing the same rules as a dart game but instead of throwing a dart, you kick a football at a giant velcro inflatable soccer dart-board. The air-inflated dartboard is covered with Velcro; players will then aim the softballs at the board. The sport is then scored the same as normal darts, or you could decide to take part for fun and not keep score. By merging two games together, this sport targets lovers of both activities and brings them together to perform a really entertaining activity. View our specials tab for current deals! Book your foot dart party today!